Inspired by the shows and the trends we’ve seen emerging on and off the runways for the past year, we’ve identified our top four print themes for the Spring / Summer 2018 time frame. From yet another iteration of the tropical trend, to a new take on the classic gingham, to Basquiat - esk markings, this season’s color and pattern direction does not disappoint. 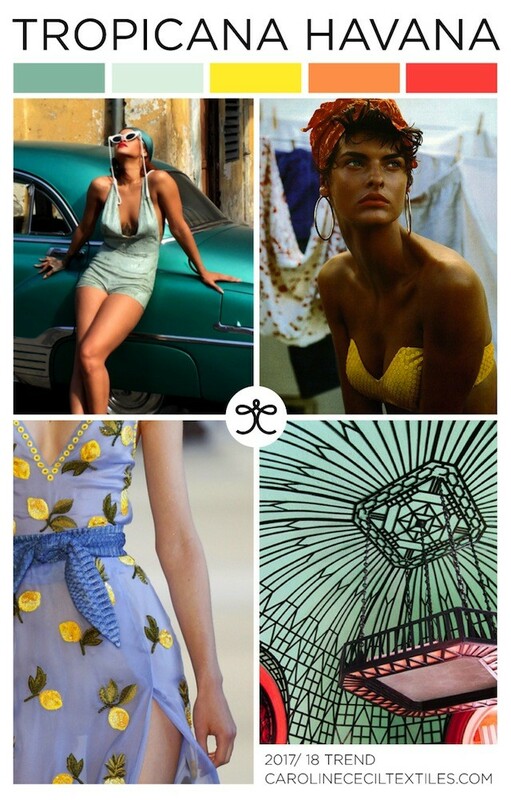 Scroll down to see mood boards for our top emerging trends as identified first on Caroline Cecil Textiles. Inspired by the colorful cultural influence of Cuba, TROPICANA HAVANA mixes printed and embellished textiles ranging from novelty fruits to animal print to palm fronds. PISTACHIO, an emerging color trend for 2018, grounds the palette with bright pops including CANARY YELLOW. Orange, red, and rust add earthy vibes to this creative and colorful trend. Cubist, Surrealist, and Abstract Expressionist art has inspired fashion for decades. 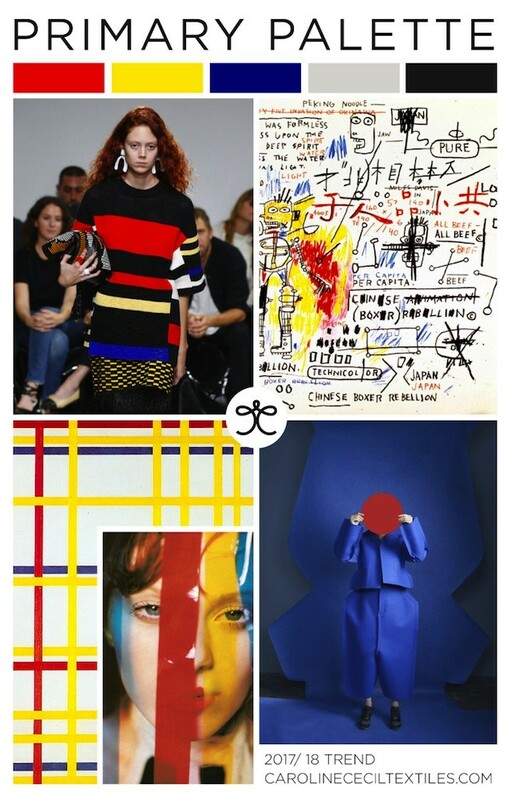 PRIMARY PALETTE features Basquiat - esk prints with Mondrian stripes in a primary color palette. The post-peak COBALT color trend makes an appearance here, giving primary blue an electric kick. Yellow is a dominante color giving an optomistic lift to this trend. 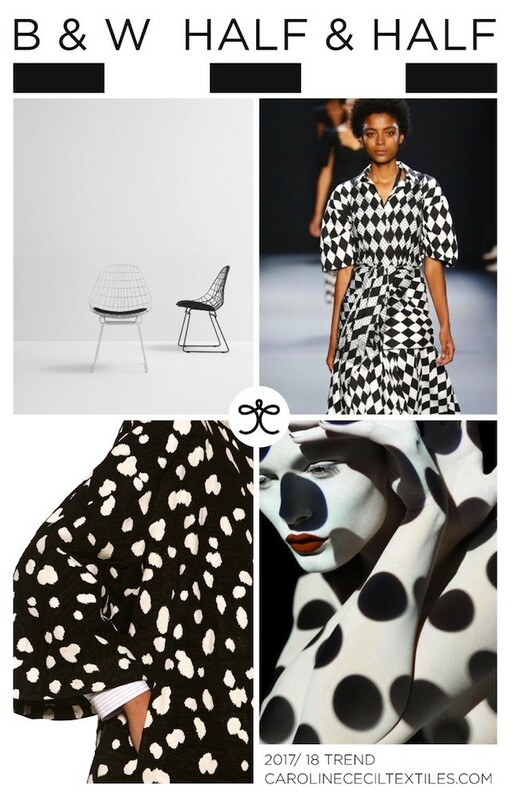 Black and white prints are shown in a very balanced composition, with half white and half black surfaces. 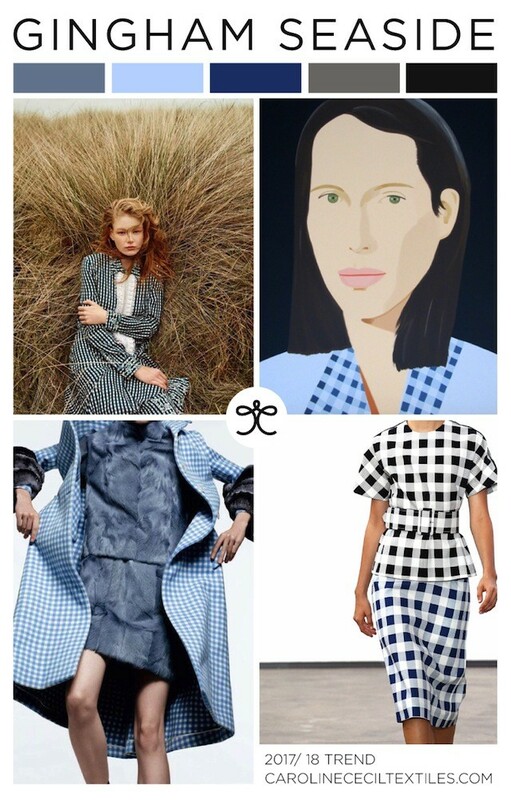 From painterly dots to harlequin checks, playful prints take on a new sophisticated heir. B & W HALF & HALF, sleek and bold. At once classic, preppy and modern, GINGHAM SEASIDE presents a new take on the mini check, in a palette of blues. I see gingham shedding it’s juvenile reputation and heading to the top of the luxury market. In addition to their hand printed line of textiles for the luxury interiors market, Caroline Cecil Textiles is a full-service textile design studio specializing in color direction, print development, and trend forecasting. Based in California, CCT works with clients in a variety of market segments. Recently featured on the cover of Harpers Bazaar, CCT has received a wide array of press spanning both the interior and fashion communities.